Definition at line 102 of file tls_cbc.h. Definition at line 107 of file tls_cbc.h. Referenced by finish(), and set_associated_data(). Referenced by Botan::TLS::check_tls_cbc_padding(), finish(), Botan::TLS::TLS_CBC_HMAC_AEAD_Decryption::finish(), output_length(), Botan::TLS::TLS_CBC_HMAC_AEAD_Decryption::output_length(), set_associated_data(), and Botan::TLS::TLS_CBC_HMAC_AEAD_Mode::valid_nonce_length(). Referenced by Botan::TLS::check_tls_cbc_padding(), Botan::TLS::TLS_CBC_HMAC_AEAD_Mode::clear(), Botan::TLS::TLS_CBC_HMAC_AEAD_Mode::key_spec(), and set_associated_data(). Referenced by Botan::TLS::check_tls_cbc_padding(), finish(), Botan::TLS::TLS_CBC_HMAC_AEAD_Decryption::finish(), Botan::TLS::TLS_CBC_HMAC_AEAD_Mode::reset(), and set_associated_data(). Definition at line 164 of file tls_cbc.cpp. References Botan::TLS::TLS_CBC_HMAC_AEAD_Mode::assoc_data(), Botan::TLS::TLS_CBC_HMAC_AEAD_Mode::block_size(), BOTAN_ASSERT, Botan::TLS::TLS_CBC_HMAC_AEAD_Mode::cbc_state(), Botan::Buffered_Computation::final(), Botan::TLS::TLS_CBC_HMAC_AEAD_Mode::iv_size(), Botan::TLS::TLS_CBC_HMAC_AEAD_Mode::mac(), Botan::TLS::TLS_CBC_HMAC_AEAD_Mode::msg(), Botan::round_up(), Botan::TLS::TLS_CBC_HMAC_AEAD_Mode::tag_size(), Botan::Buffered_Computation::update(), Botan::Cipher_Mode::update(), and Botan::TLS::TLS_CBC_HMAC_AEAD_Mode::use_encrypt_then_mac(). Referenced by finish(), Botan::TLS::TLS_CBC_HMAC_AEAD_Decryption::finish(), set_associated_data(), and Botan::TLS::TLS_CBC_HMAC_AEAD_Mode::valid_nonce_length(). Referenced by Botan::TLS::TLS_CBC_HMAC_AEAD_Mode::clear(), finish(), Botan::TLS::TLS_CBC_HMAC_AEAD_Decryption::finish(), Botan::TLS::TLS_CBC_HMAC_AEAD_Mode::key_spec(), and Botan::TLS::TLS_CBC_HMAC_AEAD_Decryption::output_length(). Definition at line 127 of file tls_cbc.h. Referenced by finish(), and Botan::TLS::TLS_CBC_HMAC_AEAD_Decryption::finish(). Referenced by Botan::TLS::TLS_CBC_HMAC_AEAD_Mode::key_spec(), and Botan::TLS::TLS_CBC_HMAC_AEAD_Decryption::output_length(). Definition at line 158 of file tls_cbc.cpp. References Botan::TLS::TLS_CBC_HMAC_AEAD_Mode::block_size(), Botan::round_up(), Botan::TLS::TLS_CBC_HMAC_AEAD_Mode::tag_size(), and Botan::TLS::TLS_CBC_HMAC_AEAD_Mode::use_encrypt_then_mac(). Definition at line 136 of file tls_cbc.cpp. References Botan::TLS::TLS_CBC_HMAC_AEAD_Mode::assoc_data(), Botan::TLS::TLS_CBC_HMAC_AEAD_Mode::block_size(), Botan::TLS::TLS_CBC_HMAC_AEAD_Mode::cbc(), Botan::TLS::TLS_CBC_HMAC_AEAD_Mode::cbc_state(), Botan::TLS::TLS_CBC_HMAC_AEAD_Mode::iv_size(), Botan::make_uint16(), Botan::Cipher_Mode::process(), Botan::round_up(), Botan::TLS::TLS_CBC_HMAC_AEAD_Mode::set_associated_data(), Botan::Cipher_Mode::start(), and Botan::TLS::TLS_CBC_HMAC_AEAD_Mode::use_encrypt_then_mac(). Referenced by botan_cipher_start(), Botan::TLS::check_tls_cbc_padding(), set_associated_data(), and Botan::TLS::write_record(). Referenced by finish(), Botan::TLS::TLS_CBC_HMAC_AEAD_Decryption::finish(), output_length(), and Botan::TLS::TLS_CBC_HMAC_AEAD_Decryption::output_length(). 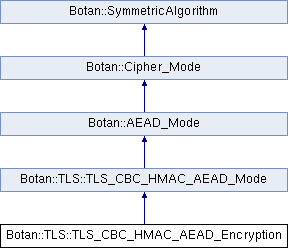 Referenced by botan_cipher_update(), Botan::XTS_Encryption::finish(), Botan::ChaCha20Poly1305_Encryption::finish(), Botan::CFB_Encryption::finish(), Botan::CBC_Encryption::finish(), Botan::EAX_Encryption::finish(), Botan::XTS_Decryption::finish(), Botan::CFB_Decryption::finish(), Botan::CTS_Encryption::finish(), Botan::CBC_Decryption::finish(), finish(), Botan::CTS_Decryption::finish(), and Botan::TLS::TLS_CBC_HMAC_AEAD_Decryption::finish(). Referenced by finish(), Botan::TLS::TLS_CBC_HMAC_AEAD_Decryption::finish(), output_length(), and set_associated_data(). Referenced by Botan::Salsa20::cipher(), Botan::CTR_BE::cipher(), Botan::RC4::cipher(), Botan::SHAKE_128_Cipher::cipher(), Botan::ChaCha::cipher(), Botan::Poly1305::clear(), Botan::CAST_128::decrypt_n(), Botan::DESX::decrypt_n(), Botan::Noekeon::decrypt_n(), Botan::IDEA::decrypt_n(), Botan::SEED::decrypt_n(), Botan::CAST_256::decrypt_n(), Botan::SM4::decrypt_n(), Botan::SHACAL2::decrypt_n(), Botan::DES::decrypt_n(), Botan::Twofish::decrypt_n(), Botan::KASUMI::decrypt_n(), Botan::Blowfish::decrypt_n(), Botan::XTEA::decrypt_n(), Botan::MISTY1::decrypt_n(), Botan::Threefish_512::decrypt_n(), Botan::Serpent::decrypt_n(), Botan::Lion::decrypt_n(), Botan::TripleDES::decrypt_n(), Botan::GOST_28147_89::decrypt_n(), Botan::SHACAL2::encrypt_n(), Botan::SM4::encrypt_n(), Botan::Blowfish::encrypt_n(), Botan::KASUMI::encrypt_n(), Botan::Twofish::encrypt_n(), Botan::Noekeon::encrypt_n(), Botan::XTEA::encrypt_n(), Botan::CAST_256::encrypt_n(), Botan::MISTY1::encrypt_n(), Botan::DESX::encrypt_n(), Botan::IDEA::encrypt_n(), Botan::CAST_128::encrypt_n(), Botan::SEED::encrypt_n(), Botan::DES::encrypt_n(), Botan::Threefish_512::encrypt_n(), Botan::Serpent::encrypt_n(), Botan::Lion::encrypt_n(), Botan::TripleDES::encrypt_n(), Botan::GOST_28147_89::encrypt_n(), Botan::OCB_Encryption::finish(), Botan::OCB_Decryption::finish(), Botan::GHASH::ghash_update(), Botan::CFB_Encryption::process(), Botan::CFB_Decryption::process(), Botan::Salsa20::seek(), Botan::CTR_BE::seek(), Botan::ChaCha::seek(), Botan::OCB_Mode::set_associated_data(), Botan::Salsa20::set_iv(), Botan::ChaCha::set_iv(), Botan::GHASH::update(), Botan::GHASH::update_associated_data(), Botan::CFB_Mode::valid_nonce_length(), and Botan::ChaCha::write_keystream().